Photo ornaments are my favorite family tradition we started with a leftover Christmas card when our girls were babies. Our collection of photo ornaments grew over the years as Courtney and Colleen grew up. Eventually, we had enough happy memories to fill an entire Christmas tree. Then our grandchildren came along—and we needed a bigger Family Photo Tree! A few years ago, we started a new tradition of decorating our tree with the grandchildren on Thanksgiving Night. That Thanksgiving Night tradition was short-lived, but it grew into a new tradition for our family. Now we host an entire Photo Ornaments Night—and we make a party out of it! On a Saturday night in December, the kids come over to our store All Things New Again after closing time. We turn our paint studio into an ornament-making workshop. Dave has photos printed from events throughout the year and cuts out shapes on scrap wood to up-cycle into photo ornaments. He has everything ready with a pile of photographs of each child ready for them to transform. Then the kids go to town choosing their photos and decorating their ornaments with paint, markers and glitter. Each photo ornament is a tiny work of art–and makes me so happy. The Artist at work — under the watchful eye of his Big Sister! This year, we switched things up again and sprinkled in some store-bought ready-to-paint wooden photo ornaments. They go on sale the week after Christmas and you can pick up a dozen or two for only a few dollars. The trick is remembering where you put them when Photo Ornaments Night comes around next year! After the paint dried, the brushes washed and the glitter swept up, we headed over to our house for more Photo Ornaments Night fun! We enjoyed donuts and hot chocolate while the kids decorated our Family Photo Tree with their masterpieces. I honestly don’t know what I enjoy more—having a fun Photo Ornaments Night with the kids or seeing their little faces smiling at me every time I walk past our Christmas tree! What are your favorite family traditions during the holidays? Let us know in the comments. Whatever makes you happy this holiday season, I hope you enjoy lots of it! Happy Holidays from all of us at All Things New Again! 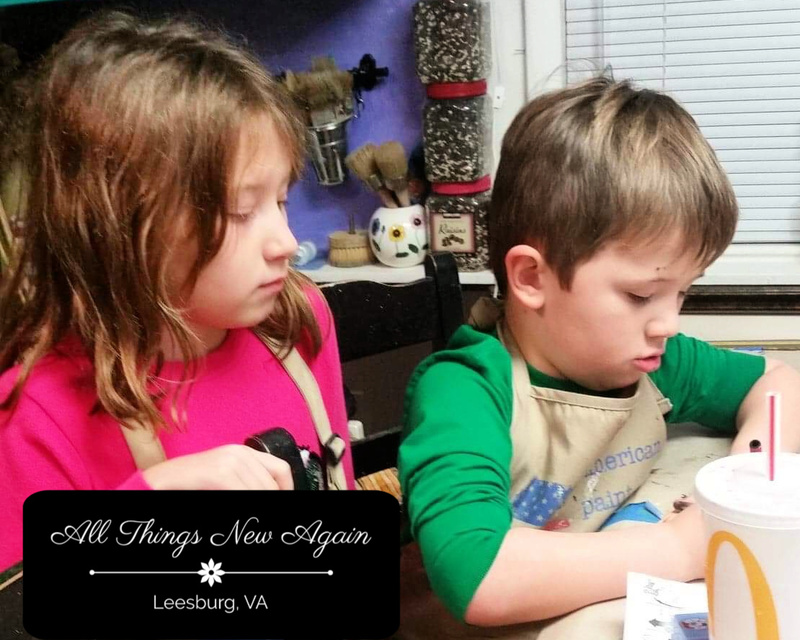 All Things New Again is a boutique furniture store and paint studio in Leesburg, Virginia — about an hour or so west of Washington, D.C. We sell hand-painted furniture and home decor along with several lines of paint for your next DIY project. We have the perfect thing to make your home beautiful for the holidays—and lots of great gift ideas too! Open Friday and Saturday 10 to 5. What a great idea – looks like fun! Those are “vintage” now! 🙂 Merry Christmas Lisa! This is the sweetest idea! I love how the kids are all involved and the tree is just precious.